We've said it many times... we are not beach people. 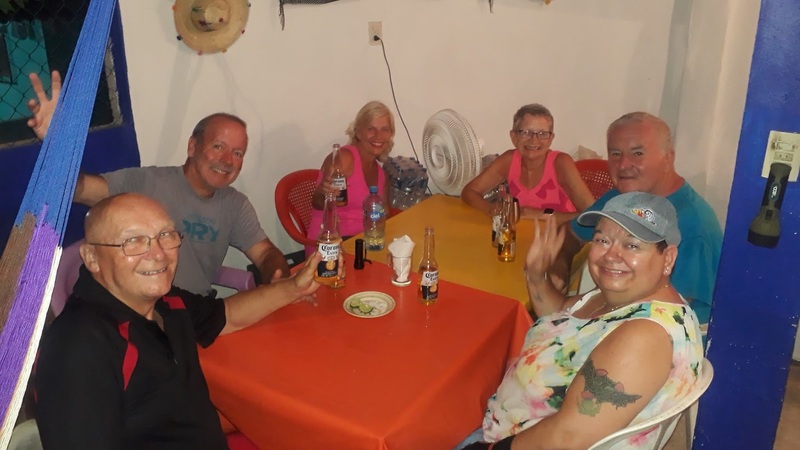 After traveling all over Mexico including all of the coastline of the entire country, we have learned that we are happiest where the temperature is a little less hot. Sure, it's pretty and it's nice to stare at the ocean and watch for sea life. But if you want to get any exercise, you have to do it at 7:00am in the morning. And then, what do you do all day? Some people go play in the water, but neither one of us is much for that. Some people fish, but neither one of us have any interest in that. We've learned that we are good for two weeks at the beach... and we are now nearing the end of the third week. When we set up the route for this trip, we knew that most people like the beaches and so we planned three full weeks of beach time. And, I think we've given the group a great experience with a lot of the southern Mexican beaches that most people never make it to. But now, we're ready to head to what we consider better weather! Highs of around 24C (75F) and lows around 8C (46F) is what we consider perfect, and that's about what we should get when we head up into the mountains on Wednesday! But, we've got two more days on the coast. 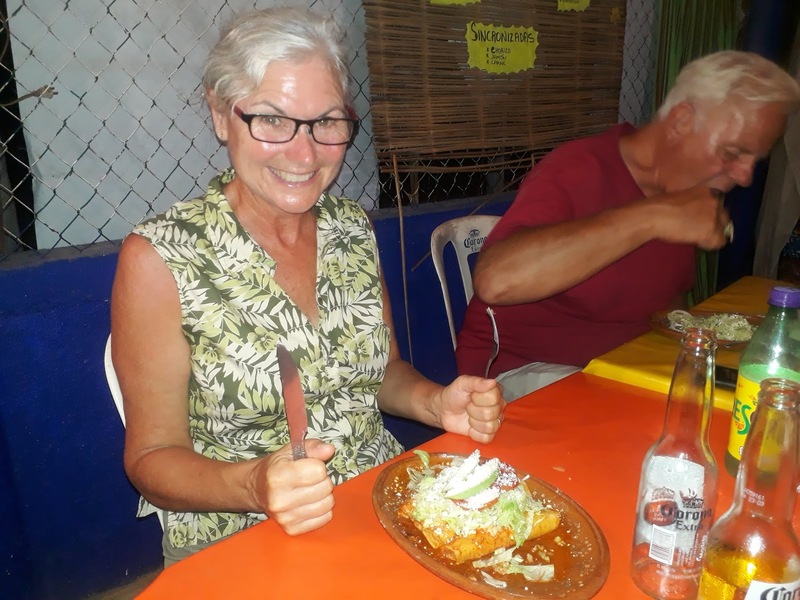 Today, we're moving to the Fonatur RV Park north of Ixtapa for a two night stay. Yesterday was all about the food. We did a group pot luck brunch. Scrambled eggs, deviled eggs, beans, chorizo and potato, fruit salad, pancakes, fizzy wine and orange juice. Nice spot with a view of the ocean. It was really successful and I think we'll do it again another day later on! The rest of the day was spent essentially doing nothing. Reading, playing backgammon, and napping in the hammock. In the evening, we went back to the ridiculously inexpensive restaurant across the road for dinner. Ruth, ready for her plate of enchiladas! Ruth, Garth, Wendy, Paul, and Lynnette. Barry, Bob, Denise, Sue, Roy, and Jeannie. Lost of fun, and another typical Mexican meal. Late start today because we're only going about 70 kms (44 miles) up the road. Through Zihuatanejo and then north of Ixtapa. I totally agree with you about the beach. Mountains are way awesomer! We even found that to be a problem when we stayed in the Keys for a month. No problem here in the mountains. Safe travels and Enjoy the short drive. I don't know what it is but we just love being in the mountains. Maybe if it wasn't so hot here at the beach we might enjoy it more. I think most of it is because we love hiking and there is just so much more opportunities for that in the mountains. Okay Ruth! You´ve got me hungry for enchiladas! Have fun! Everybody has a nice tan. I am so pale this winter. I was just thinking the same thing Angi said..."everyone looks so tan." Beach life must agree with the group! Lol, those were delicious enchiladas and there was no way anyone was gonna have them but me! I think maybe you commented on the wrong post but you are right, doing the research beforehand and actually moving around the country gives you so many more opportunities to see things that others don't. Those waterfalls are amazing and not well known to most people who visit Mexico. 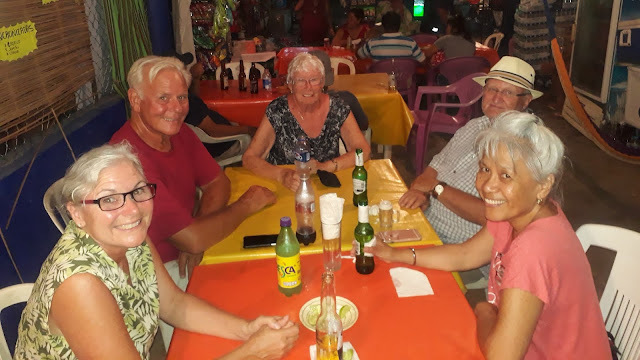 We've spent a lot of time in Mexico in the past, up lo de Marcos way, but want to get to the more southerly area, plus travel in a groups /caravan. Do you run such an enterprise? If so, give us the details. We live on Vancouver Island, not cold as Saskabush , I'm originally from northern Manitoba, so I know what it's like. But here on the Island it's miserably cold with the constant rain and no /little sunshine. Most winters lately we've been staying in the Yuma area, some/mostly boondocking, but yearn to visit Mexico again.